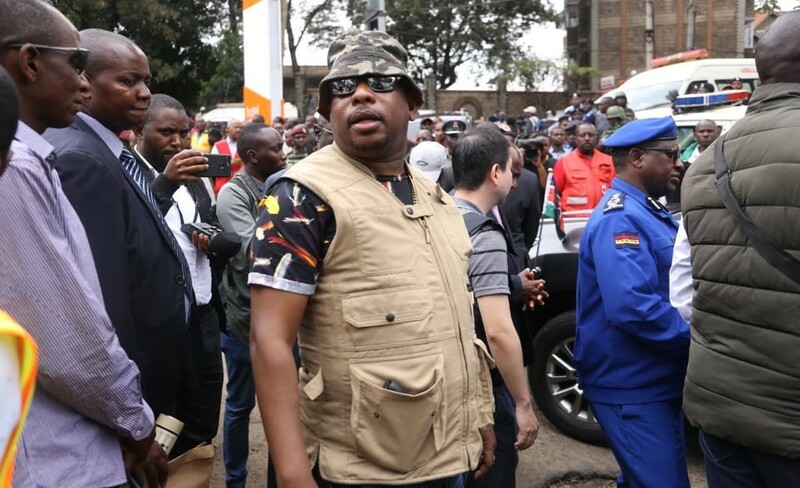 Nairobi Governor Mike Sonko was not brandishing a gun during a briefing at Riverside Drive on Wednesday morning. Straight from Mombasa, the county boss came home to a terrorist attack at the Dusit D2 Hotel complex. The deadly attack started on Tuesday at around 3 pm, and the governor was at around the same time “building bridges” between Mombasa Governor Ali Hassan Joho and his opponent Suleiman Shahbal. He received flak for being clueless about the goings on in his city from Kenyans online. During the media briefing led by Interior CS Fred Matiang’i outside the crime scene, Sonko looked ridiculous in dark shades, looking like a military man and in his right side jacket pocket was what appeared to be a gun. Hawk-eyed Kenyans noticed the “gun” but according to his communications director Elkana Jacob, what he was carrying was a power bank. “That object in the governor’s pocket wasn’t a pistol. You would easily know that if you have knowledge of how a pistol looks like. That object was a power bank,” Mr Jacob told eDaily. I acquired the power bank while on tour in the United States some time back. So, I would confidently confirm to you that Mr Sonko was not brandishing a gun at dusitD2 Hotel,” he added. The coordinated attack left 21 people dead, many nursing injuries and 50 others still missing. Security operations in the area have since been called off and security officers piecing together evidence. So far, two people have been arrested and according to the Star, police are hunting for another man seen with the six terrorists at an eatery along Limuru Road hours before the attack.